On this date in 193, Didius Julianus lost the rulership of Rome for which he had paid so dearly. Julianus‘s path to these doleful pages begins with the assassination of the notorious Emperor Commodus at the end of 192. That man’s successor, Pertinax, was a notable bust with the Praetorian Guard, the elite imperial bodyguard whose status as the only military unit in Rome made it potential — and here, actual — kingmakers. The Praetorians expected the payoff that had become customary for new executives, and when Pertinax proved less than liberal on that particular budget item, they turned right around and overthrew him. To see that there would be no mistake the next time around, the Praetorians dispensed with the pretense and brazenly auctioned the purple. Roman aristocrat and historian Cassius Dio was a witness to this hot mess. Didius Julianus, at once an insatiate money-getter and a wanton spendthrift, who was always eager for revolution and hence had been exiled by Commodus to his native city of Mediolanum, now, when he heard of the death of Pertinax, hastily made his way to the camp, and, standing at the gates of the enclosure, made bids to the soldiers for the rule over the Romans. Then ensued a most disgraceful business and one unworthy of Rome. For, just as if it had been in some market or auction-room, both the City and its entire empire were auctioned off. The sellers were the ones who had slain their emperor, and the would-be buyers were Sulpicianus and Julianus, who vied to outbid each other, one from the inside, the other from the outside. They gradually raised their bids up to twenty thousand sesterces per soldier. Some of the soldiers would carry word to Julianus, “Sulpicianus offers so much; how much more do you make it?” And to Sulpicianus in turn, “Julianus promises so much; how much do you raise him?” Sulpicianus would have won the day, being inside and being prefect of the city and also the first to name the figure twenty thousand, had not Julianus raised his bid no longer by a small amount but by five thousand at one time, both shouting it in a loud voice and also indicating the amount with his fingers. So the soldiers, captivated by this excessive bid and at the same time fearing that Sulpicianus might avenge Pertinax (an idea that Julianus put into their heads), received Julianus inside and declared him emperor. The ignoble achievement is the only thing Didius Julianus is now remembered for. While Julianus and the Praetorian guard were conducting their damnable business in the capital, three Roman generals in the provinces claimed the throne for themselves. For centuries the Roman legions had been scattered beyond the Italian peninsula as a hedge against military coups. But after decades of relative stability at the top,* Rome was about to get a bracing reminder of what civil war looked like. Praetorians — a few cohorts worth of men not in fighting trim — were fine for bullying Senators, but in an outright civil war, they were no match for the legions. The Praetorian Guard’s power to arbitrate the succession was contingent upon the beneficiary’s capacity to cement his own legitimacy by commanding the loyalty of (most of) the state apparatus. And it turned out that buying the sceptre on spqrBay was not the way to get folks to bend their knees to it. Septimius Severus, the imperial claimant nearest to the capital, commenced a relentless and virtually unresisted march on Rome, co-opting the troop garrisons and towns as he swept down the peninsula and spurning Julianus’s desperate diplomatic entreaties. Cassius Dio’s record of Julianus scrambling to defend Rome against Severus is full of black humor. 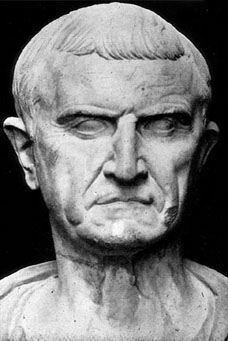 Julianus … caused the senate to declare Severus a public enemy, and proceeded to prepare against him. In the suburbs he constructed a rampart, provided with gates, so that he might take up a position out there and fight from that base. The city during these days became nothing more nor less than a camp, in the enemy’s country, as it were. Great was the turmoil on the part of the various forces that were encamped and drilling, — men, horses, and elephants, — and great, also, was the fear inspired in the rest of the population by the armed troops, because the latter hated them. Yet at times we would be overcome by laughter; for the Praetorians did nothing worthy of their name and of their promise, for they had learned to live delicately;** the sailors summoned from the fleet stationed at Misenum did not even know how to drill; and the elephants found their towers burdensome and would not even carry their drivers any longer, but threw them off, too. But what caused us the greatest amusement was his fortifying of the palace with latticed gates and strong doors. For, inasmuch as it seemed probable that the soldiers would never have slain Pertinax so easily if the doors had been securely locked, Julianus believed that in case of defeat he would be able to shut himself up there and survive. the soldiers, convinced by letters of Severus that if they surrendered the slayers of Pertinax and themselves kept the peace they would suffer no harm, arrested the men who had killed Pertinax … We [the Senate] thereupon sentenced Julianus to death, named Severus emperor, and bestowed divine honours on Pertinax. And so it came about that Julianus was slain as he was reclining in the palace itself; his only words were, “But what evil have I done? Whom have I killed?” He had lived sixty years, four months, and the same number of days, out of which he had reigned sixty-six days. A harsh deal for Didius Julianus was a pretty good one for the Roman Empire. 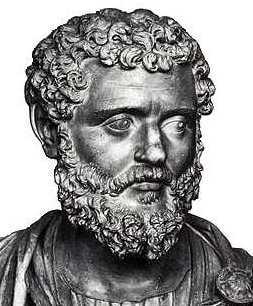 Septimius Severus cleaned up his other rival claimants, and ran the empire capably for the next generation. Kick back with this review of the the dreadful interlude of Didius Julianus with episodes 98 and 99 of the enjoyable History of Rome podcast. * “The period in the history of the world during which the condition of the human race was most happy and prosperous,” in the judgment of Edward Gibbon. ** The Praetorians were also de-motivated because their promised donative had not been forthcoming. On this date* in 284, one of Rome’s greatest emperors claimed the purple by summarily executing his rival before the approving army in Anatolia. The Emperor Diocletian christened his reign with a bit of scaffold theatricality, but he might have been the real perp. For half a century, the Roman Empire had waded through crisis. In its political manifestation, a parade of forgettable emperors had marched through the throne room, each to be assassinated, overthrown, or otherwise disposed of by some equally forgettable aspirant en route to a similarly unenviable end. At length, out of this unpropitious bunch, rose one Diocles, a low-born Dalmatian of classical education whose martial gifts saw him rise through the legions. His opportunity came when the emperor Carus, barely a year on from succeeding his assassinated predecessor, died on campaign against Persia allegedly struck by lightning (quite possibly a euphemism for something more dagger-like), leaving his son Numerian in charge. As the army meandered back to the friendly confines, Numerian secluded himself in his litter. And after a while, the litter started to stink. Sometime on the journey, he’d been secretly killed — but by whom? The principals this day are our leading suspects. (And it’s a little mystifying in either case just what was gained by leaving the body hidden so long.) We turn to Gibbon to narrate what must have been a riveting — not to mention definitive — proceeding adjudicating between them a few kilometers past Nicomedia (moder Izmit, Turkey) towards Chalcedon (now the Kadikoy district of Istanbul). A general assembly of the army was appointed to be held at Chalcedon, whither Aper was transported in chains, as a prisoner and a criminal. A vacant tribunal was erected in the midst of the camp, and the generals and tribunes formed a great military council. They soon announced to the multitude that their choice had fallen on Diocletian, commander of the domestics or body-guards, as the person the most capable of revenging and succeeding their beloved emperor. The future fortunes of the candidate depended on the chance or conduct of the present hour. Conscious that the station which he had filled exposed him to some suspicions, Diocletian ascended the tribunal, and raising his eyes towards the Sun, made a solemn profession of his own innocence, in the presence of that all-seeing Deity. Then, assuming the tone of a sovereign and a judge, he commanded that Aper should be brought in chains to the foot of the tribunal. “This man,” said he, “is the murderer of Numerian;” and without giving him time to enter on a dangerous justification, drew his sword, and buried it in the breast of the unfortunate praefect. ** A charge supported by such decisive proof was admitted without contradiction, and the legions, with repeated acclamations, acknowledged the justice and authority of the emperor Diocletian. Though there isn’t any direct evidence of it, posterity is entitled to suspect on grounds of means, motive and opportunity, that the eventual beneficiary of Numerian’s demise — the emperor henceforth known as Diocletian — was its true author. Whether obtained by fair means or foul, Diocletian put the laurels of state to good use, stabilizing government by introducing the “Tetrarchy” — the rule of the empire’s eastern and western halves by two emperors (“Augusti”) each aided by a “Caesar” who was also the heir apparent. Diocletian’s two decades in power before his anomalous voluntary retirement constitute a watershed in the late history of Rome, and not only because the cycle of imperial assassinations and civil war took a welcome generation-long hiatus. Although he’s also remembered for initiating the last major persecution of Christians, his administration set the stage for the rise of Constantine the Great, the Galilean’s first imperial champion. Constantine’s father was one of the original tetrarchs, the Caesar of the west. * As with much in the ancient world, sourcing is tenuous, and there is some scholarly debate over whether the events in this post should be ascribed to November 20, or to November 17, or to September 17, or to some other date. Since this blog, notwithstanding its title, embraces the occasional execution whose date is uncertain, I am prepared to wave aside textual uncertainty in the interest of a ripping good story. 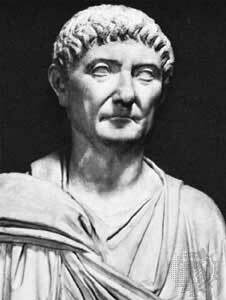 ** According to the Historia Augusta, Diocletian had a superstitious reason to carry out this bloodthirsty act personally. This story my grandfather related to me, having heard it from Diocletian himself. “When Diocletian,” he said, “while still serving in a minor post, was stopping at a certain tavern in the land of the Tungri in Gaul, and was making up his daily reckoning with a woman, who was a Druidess, she said to him, ‘Diocletian, you are far too greedy and far too stingy,’ to which Diocletian replied, it is said, not in earnest, but only in jest, ‘I shall be generous enough when I become emperor.’ At this the Druidess said, so he related, ‘Do not jest, Diocletian, for you will become emperor when you have slain a Boar (Latin: Aper).’ ” … It is now well known and a common story that when he had killed Aper, the prefect of the guard, he declared, it is said, “At last I have killed my fated Boar.” My grandfather also used to say that Diocletian himself declared that he had no other reason for killing him with his own hand than to fulfill the Druidess’ prophecy and to ensure his own rule. For he would not have wished to become known for such cruelty, especially in the first few days of his power, if Fate had not impelled him to this brutal act of murder. Part of the Themed Set: The “Ex” Stands For “Extrajudicial”. Over the course of this day in 31, Lucius Aelius Seianus went from virtual master of the Roman Empire to strangulation at the order of the Senate. 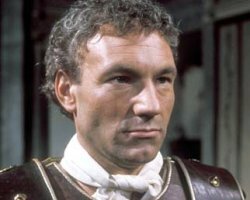 Patrick Stewart as Sejanus in I, Claudius. Known simply as Sejanus, he was of equestrian stock who rose to prefect the Praetorian Guard when Tiberius succeeded Augustus as Rome’s first citizen. It was not yet the “infamous Praetorian Guard”. Sejanus would make it so: his were the institutional aggrandizement — long outliving Sejanus — that would position the Guard to arbitrate imperial succession; his the persecutorial internal policing that made it a swords-and-sandals Gestapo. Sejanus maneuvered skillfully towards supreme power in Rome — and ruthlessly enough that he is suspected of having murdered Tiberius’s son and heir Drusus. Though the Emperor refused a dynastic marriage with Drusus’s widow that would have set Sejanus up for official succession, the Praetorian had the purple in all but name in the late 20’s when Tiberius decamped for the dissolution of Capri. The usual sort of thing ensued: spies, informers, purges and political murders. The Republic had been down this road before. After the peace of Augustus, it was a chilling preview of Imperial Rome’s coming attractions. Unlike most of those, the Sejanus issue was ultimately resolved without civil war. Finally wise to his captain’s game, Tiberius snuffed out the threat in a single blow without bestirring himself from his island retreat by sending word to convoke Sejanus and the Senate to elevate the soldier to the tribunate … and having a letter there read which demanded the soldier’s arrest. That august old body — “men fit to be slaves,” in Tiberius’s estimation — took it from there. Sejanus was summarily executed this very evening, his body torn apart by the mob, and a witch hunt for his lieutenants and supporters immediately began. Nice coverage of Sejanus and Tiberius on the History of Rome podcast.